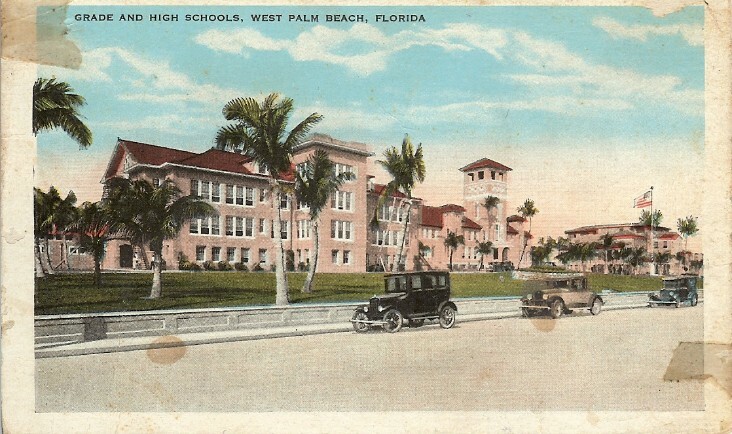 Vintage Post Card - PALM BEACH HIGH SCHOOL - 19?? 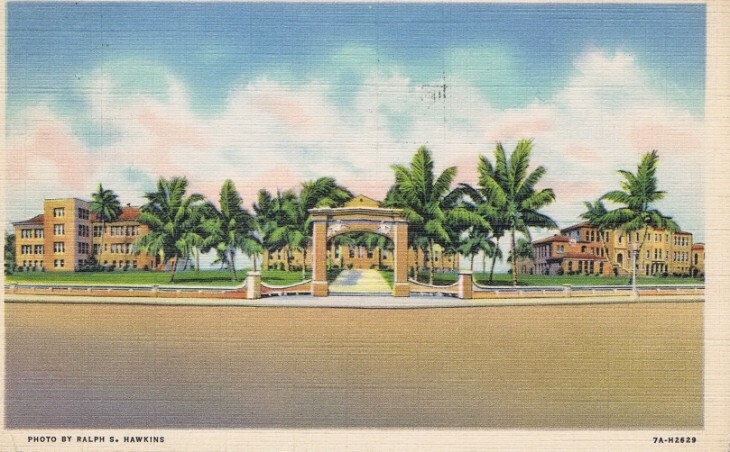 "The Schools on the Hill"
Vintage Post Card - PALM BEACH HIGH SCHOOL - 194? Palm Beach High School, in West Palm Beach, Florida, is a rare and unique educational institution with a long and colorful history. In the late 1890's, the schools in this area were primarily one room classrooms located along the shores of Lake Worth. As the number of students increased in grades one through twelve, the town recognized the need for a central school with a high school facility. Around 1900 the school was located in a little four-room school house at Clematis Street and Dixie Highway. The high school was named Palm Beach High and the first graduating class was in 1907. During this time, the population of West Palm Beach grew from 564 in 1900 to 1,743 in 1910. The principal architecturial designer, W.W. Maughlin, used the Mediterranean Revival style, which was popular at that time in south Florida buildings, both public and private. The old city school became the Palm Beach County courthouse in 1909 when the Florida legislature created Palm Beach County from the north end of Dade County. Some of the children attending here walked to school-- which was in the middle of wilderness-- and others were brought by horse drawn wagon. They all piled into the single, two story building, with its distinctive tall tower. Large classrooms lined each side of the wide, central hallways on both floors. In 1928, one of south Florida's worst hurricanes took its toll on the school building,completely destroying the tower. the tower was never rebuilt. By 1922, there were three school buildings on the "hill". Central Junior High was built in 1915 just south of the original building, which became the elementary school. Palm Beach High School's main building was built on the "hill" to the north of the elementary school building in 1922. Over the years, other buildings were added to house the various growing needs of the schools. A vocational educational building was constructed just behind the high school building, with shop facilities located across the street. Farther down the "hill", an auditorium was constructed with an attached choir and band building, which adjoined the football field. to the rear of the elementary building, an addition housed more elementary class- rooms and a large cafeteria. Eventually, two separate gymnasiums were built. the total area consumed by the "School on the Hill" eventually exceeded two whole city blocks sprawling from Georgia Avenue on the east, to Tamarind Avenue on the west, and from Gardenia Street on the north, to Iris Street on the south. The last Palm Beach High School senior class graduated in the Spring of 1970. The next Fall, integration brought the end of Palm Beach High and Roosevelt High schools when these two historic schools were integrated into a new entity on the hill called Twin Lakes High School. Roosevelt High School became a middle school. Twin Lakes high opened in the old buildings on the hill in the Fall of 1970, but moved into its new building on Twin Lakes Boulevard in January 1989. The three original buildings of the "Schools on the Hill" were later restored and in 1997, received a new life as the Palm Beach School of the Arts.